God providentially led us to this book! It’s not a book I would normally pick up, based on its cover. It has, however, proven to be a very valuable book in this era of our lives! We highly recommend it to mothers and their daughters. 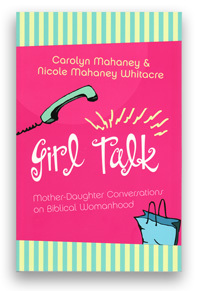 Recognizing the importance of a mother passing on the "language of Biblical womanhood," Carolyn Mahaney and her oldest married daughter alternately address mothers and daughters on key issues of godly womanhood. I have read it aloud with each of our daughters individually. The suggested discussion questions have opened up all sorts of topics that the girls and I needed to talk about, and we are all really enjoying our monthly "Girls Afternoon Out" thanks to the book’s great suggestion! 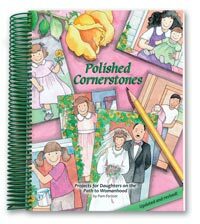 If you are looking for a book that will build a deeper relationship between you and your daughters, this is the book! One word of warning! 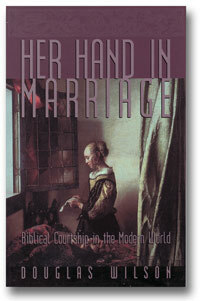 If you have any daughters that are nearing their wedding day, read Chapter 24, "Who Gives This Woman?" by yourself so you can have a good cry before you read it along with your daughter!